Paint me Ceramics01485 534340work Art GalleryPaint me Ceramics is a "Paint it yourself Pottery Studio" situated in the West Norfolk costal town of Hunstanton. Our studio is a wonderful place to relax, unwind and paint your own unique masterpiece. Pottery painting is for all ages which can be enjoyed on your own, with a group, family or friends. It is the perfect place to make a unique gift for someone special or just to treat yourself. In addition to pottery painting, Paint me Ceramics specialises in "baby hand and foot prints" Capture your child's prints before they grow! Pottery prints make superb keepsakes especially for loved ones, grandparents and family friends. For those who are not creative, we have lots of rubber stamps, sponges, stencils and design books to inspire you. You really do not need to be an artist to paint pottery! All underglaze paints are non toxic and child friendly. The glaze is also dishwasher safe. All glazed items will need to be fired in our onsite kilns and can either be collected a few days later or sent by our 24 hour courier. There is a studio fee of £3.50 per painter and your additional cost will be your chosen pottery. All baby prints and general assistance is included in your fee. Just bring the children and enjoy! We even do paw prints on pottery! 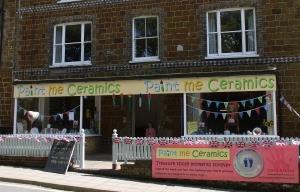 Tina "brilliant day out for all ages"
Krysta "Just received my order and I'm overly pleased with the service"
Paint me Ceramics is a "Paint it yourself Pottery Studio" situated in the West Norfolk costal town of Hunstanton. Our studio is a wonderful place to relax, unwind and paint your own unique masterpiece. Pottery painting is for all ages which can be enjoyed on your own, with a group, family or friends. It is the perfect place to make a unique gift for someone special or just to treat yourself. Lynsey "yay! pottery just came it looks AMAZING! Last admission for painting is 4pm. Studio will open out of normal hours for group and party bookings, please call Fran on 07435780114 to make your group booking for an evening.